If you like black licorice and caramel, you’ll love these. The initial bite reveals the sharp taste of anise that soon mellows to a sweet caramel with just the faintest hint of coconut. Uhmmm, please excuse me while I go grab another one…. These will be fine if stored on the counter for a day or two, but after that should be kept in the fridge. Bring to room temperature before serving. Line a square baking dish with greased parchment. In small bowl, combine rice flour, tapioca starch, coconut flour, and xanthan gum. Put first 6 ingredients into a pot and heat on high stirring constantly until they reach 265 degrees. Remove pot from heat and stir in flour mixture and 1 Tablespoon of anise extract. Add food colouring if using. Pour into square cake pan and place in fridge for 30 minutes. Once firm, remove cake pan from fridge and invert over a large cutting board to remove candy. Peel the parchment off of the top of the candy and using a large, sharp knife cut into squares. Place squares of candy in a lidded bowl and drizzle with ½ tablespoon of anise extract. Cover and shake to coat all the pieces. This entry was posted in Baking, Recipes and tagged anise, candy, caramel, celiac, coeliac, GF, gluten free, gluten free in Red Deer, licorice, recipe. Bookmark the permalink. Very interesting flavors! Thanks for sharing! This looks interesting. 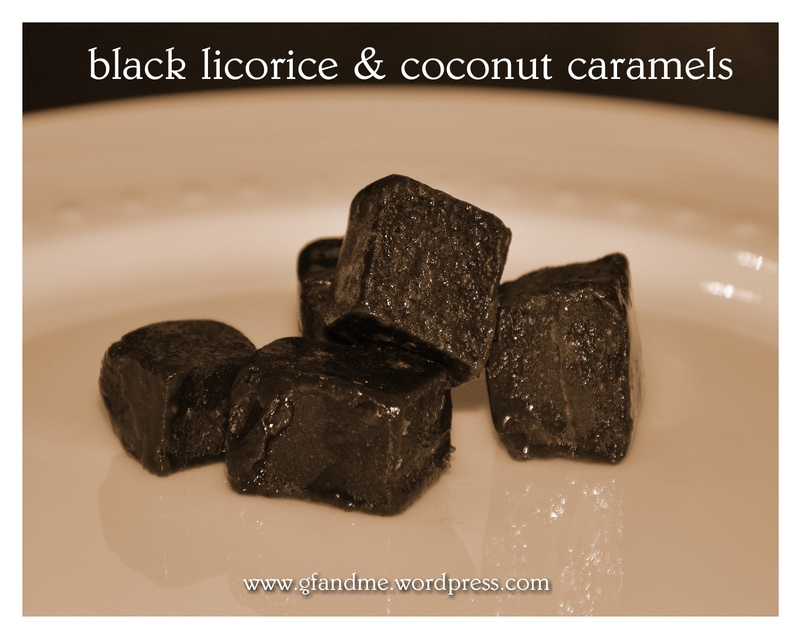 I bet my hubby would probably like them since he loves caramel and black licorice! I bet he would. My grandparents used to buy kraft caramels in assorted flavours and the licorice ones were always my favorite – followed by the mint and coffee ones. These look curiously delicious! I have missed black licorice so much! I know, right! To be honest, I was aiming more for licorice when I made these the first time 😉 but they are really good caramels! Yum! I am definitely trying to make these! Hm. If I replace the dairy ingredients with non-dairy alternatives do you think the recipe would still work? It would be the butter that would be hard to replace I would think. If you try it, let me know how it goes.